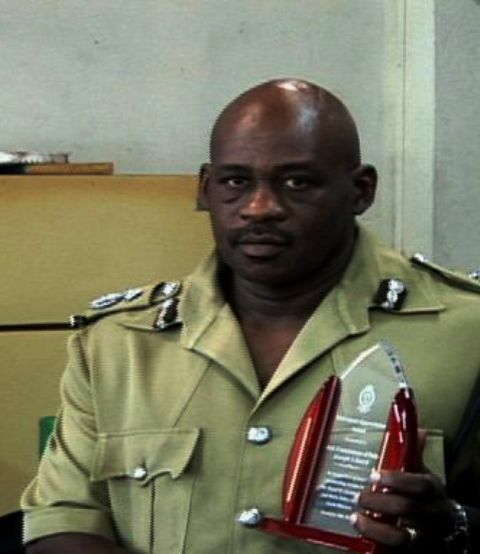 Assistant Commissioner of Police for Crime Mr. Joseph Liburd. CHARLESTOWN, NEVIS (November 23, 2010) — Insightful and supportive, assertive and dedicated were the adjectives used, last Friday [Nov. 19] to describe Assistant Commissioner of Police [ACP] for Crime on St. Kitts-Nevis Mr. Joseph Liburd. It was then that members of the Nevis division of the Royal St. Christopher and Nevis Police Force gathered in the conference room at the Charlestown Police Station where they bid farewell to the long serving officer at a ceremony in his honour. A number of police officers, including Commissioner of Police on St. Kitts-Nevis Mr. Austin Williams, Acting Commissioner of Police Mr. Stafford Liburd and ACP for operations Mr. Joseph Richardson delivered remarks and spoke of their relationships with the retiree. “We do not just want to say goodbye. We also want to say thank you and we want to wish you well. It’s a bit hard to know where to begin because we have a lot of reasons to say thank you,” Commissioner Williams said as he thanked Mr. Liburd for his years of service to the police force. “No job is easy all of the time and some people would say our work is never easy but you have always been prepared to put in the hard work,” he added as his eyes glanced across at Mr. Liburd. ACP Richardson, who will now take up the post of ACP for crime, said he was always impressed with Mr. Liburd’s knowledge of policing. In commenting on Mr. Liburd’s work style, ACP Richardson and several others said he [Joseph Liburd] believed in teamwork. “He really is a team player; a true team player; not a player just for the part but a sincere team player,” Mr. Richardson said. 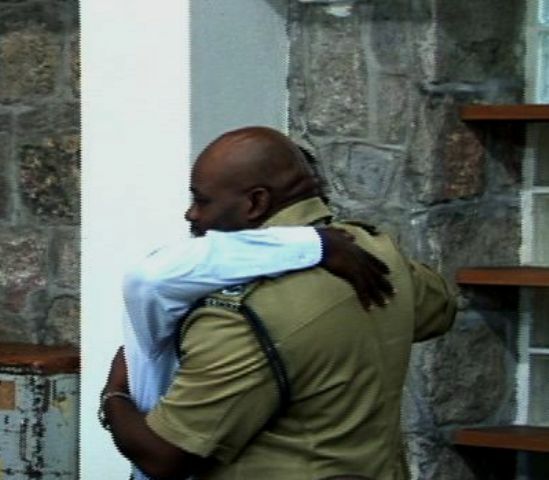 Emotional embrace between Assistant Commissioner of Police for Crime Mr. Joseph Liburd and Assistant Commissioner of Police for Operations Mr. Joseph Richardson. Touched by the presentation, Mr. Liburd removed himself from the head table and embraced his colleague at that emotional moment of the farewell ceremony. Two of the three decades he worked as a police officer, was spent in the Nevis division where, Mr. Liburd believed, he was given an opportunity to broaden his policing horizon. “I enjoyed my years of service here in the Nevis division. Working in Nevis helps you to learn policing, not only from your peers or your seniors but also from your juniors,” he said and used that opportunity to publicly thank several police officers for their assistance over the years. In his concluding statements, Mr. Liburd pledged his continued commitment to preventing and detecting crime in the twin-island federation while reminding officers that they would be welcomed to utilizing his tutorial services as they prepared for promotion examinations. Members of the Nevis division of the Royal St. Christopher and Nevis Police Force at ACP Liburd’s farewell ceremony. During his tenure as an officer of the law, Mr. Liburd was named valedictorian at the Advanced Detective Training in Barbados, topped the Command Course in Jamaica, obtained a Post-Graduate Certificate in Police Leadership and Criminal Justice at the Centric Grant Hill College in England and obtained a Bachelor of Science Degree in Criminal Justice Management. It was during Corporal Collins-Percival’s presentation of the retiree’s profile, that many learnt that Mr. Liburd was the first member of the Royal St. Christopher and Nevis Police Force to obtain a bachelor’s degree. “He used his challenges as fuel to propel him forward while constantly exploring ways to grow; both personally and professionally,” Corporal Collins-Percival said. The island’s Premier the Honourable Joseph Parry and his Permanent Secretary Ms. Angelica Elliott were also present at the farewell ceremony.